A Filipino Executive Chef of Travelodge Australia Marx Canoy recently shared his expertise in cooking and proper food handling among the community sites of ABS-CBN Lingkod Kapamilya Foundation, Inc.
As part of giving back to his fellowmen, Chef Marx, a native of Bacolod City, educates various communities on how to prepare the ingredients and cook properly. He wanted to help the ordinary people do extraordinary in cooking and do micro-business in the community. Chef Canoy believes that Filipino cuisine has the capability to compete with international cuisine by putting into practice a clean, creative, and traditional way of preparing Filipino food. “Ang Filipino cuisine ay kayang makipag-sabayan sa mesa ng ibang bansa. International din tayo. Kaya bilang Chef sa Australia, gusto ko din makatulong sa ating communities dito sa Pilipinas kung gaanokahalagaang proper food-handling. Makatulong tayo sa mga nag-titinda kung paano maging malinis sa pagtitinda, malinis na, kikitaka pa.” said Chef Marx Canoy, Filipino Executive Chef of Travelodge in Australia. 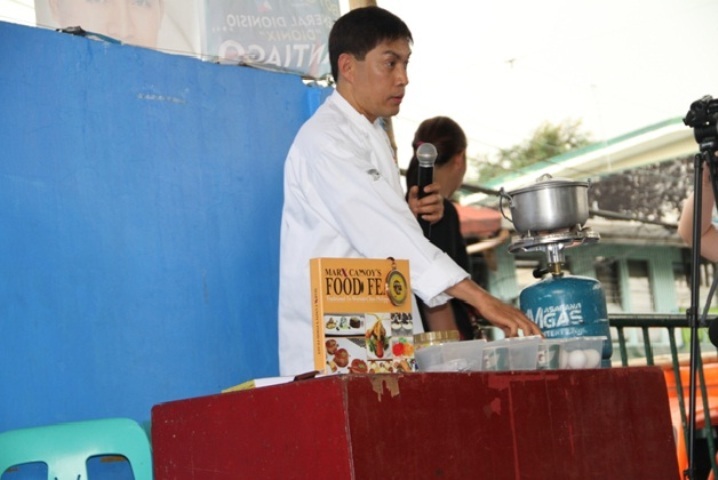 He was able to share his knowledge in proper food handling and cooking strategies with Kapit Bisig para sa Ilog Pasig communities at Paco Market and Brgy 828, Estero de Concordia, Pandacan, Manila on March 3, 2016. He also shared his cooking expertise to Bantay Kalikasan communities at Samar, Leyte last March 14-19, 2016 and in Puerto Princesa community in Palawan last March 21-26, 2016. Activities conducted by Chef Marx Canoy at various communities in the Philippines were attended by people from all walks of life. They were so grateful that they were able to learn more techniques on how to properly prepare food clean and safe for the benefit of their own as well as for the community. Chef Marx Canoy with the People's Organization in Dulag, Leyte.